So, a couple of weeks ago, I'm surfing around on eBay, itching to buy something, and I get this bizarre notion in my head that I want to buy some fountain pen nibs. I don't know why, I just did. I have many fetishes (such as the tiny padlock fetish mentioned earlier), and one of them is office supplies. I've had a fascination with quill pens since I was very young. 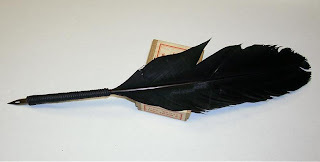 I bought my first feather quill when I was about 6 or 7 at the William McKinley Presidential Library & Museum. In the 80's and 90's I used to write letters to friends with a calligraphy pen. So again, I'm on eBay, looking at pen nibs, and I find several auctions that I like. I bid on 5 of them (why I needed that many I don't know). I didn't expect to win all of them, but when I only won two (which sound have been plenty), I some how became incensed and determined that I must have more. As I mentioned in several older posts (remember the tiny locks? ), when I get a hankering and make an impulse buy of some small trinket that I desperately want, I tend to buy a lot of them. I mean, a lot of them. 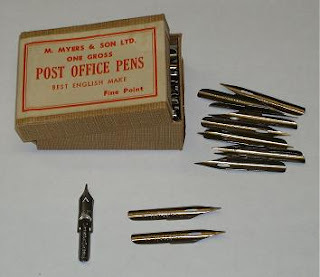 So I went back on eBay to look for more, and I found a great little offering from Australia selling antique, new in box, post office pen nibs from England in gross boxes. It was all I could do to resist buying more than two boxes. Why I would ever need more than 288 pen nibs of the same size, is beyond comprehension. But I bought them. They are pictured above, along with one of a set of a dozen from another auction (lower left). So, what to do with them, but make pens! I couldn't find any good deals on pen holders (the handles), so I decided to make some for myself. In the past I have taken turkey feathers from the craft store and cut them to make quill pens and sold them at my store for spell writing. They sell rather well, but they write for crap. I figured that a cheap and simple solution would be to glue the new pen nibs right to the tip of the feather and then wrap the joint for aesthetic purposes, and voilà, a good quality stylish writing instrument that was cheap and easy to make. I used 5 minute epoxy to set the nibs in place, and then wrapped them with a leather cord, which I affixed with super glue. I also stripped some of the feather back to make a longer handle. Otherwise, the feather tends to get in the way of your hand when writing. I only had black and white feathers, but I intend to make some other colors when I get the chance. Ironically, about two days after I made these, I found a seller on eBay that was making the exact same thing. They even looked to be using the same type of nib and even wrapping them in the same type of leather cord. Weird. They are charging like $12+shipping each for theirs. I am only charging $7 each for mine in my store. The first pen I made was actually a wooden handled one. It took me about an hour, maybe a little more, to make. I carved out a spot on the tip of a wooden dowel so the nib would sit flush. Then I did some tapering to the ends. It took me a little bit to decide how to decorate it, but I decided on engraving the handle with a motto, written in Theban script, and spiraling up the handle. It says "power of the word". Sort of a nod to that whole "the Universe was created with a word" thing. I used a piece of tape and wrapped it in a spiral around the shaft and marked along one edge with a pencil to get my baseline. Then I penciled in the letters. I had to redo this step three times. The first time, the spiral was going the other way, and the letters didn't want to lean that direction. It looked awkward. The second time I wrote "The power of the word", but found I didn't have enough room, so I truncated the first article. The third time it worked perfectly. Next I used a Dremel with a tiny tiny engraving bur to carve out the letters. Then I sanded and stained it with a mahogany stain and gave it two coats of polyurethane. I was content to leave it like that, but a few days later I decided to wrap the joint like I did with the feather quills. I'm still not sure which way I like it better. So, all told, I now have around 350 quill pen nibs in about three different styles (not including my own personal collection of around 30 different speedball nibs for calligraphy). And of course it didn't stop there. Once I had nibs on the way, I decided I would have to make pens to sell in the store, and I can't sell pens without ink, so I had to go shopping for ink. I bought a 32oz. bottle of black india ink that I could repackage. But, of course that meant I would need bottles to repackage the ink. I searched around and the best deal I could find was on eBay for a lot of 288 bottles (WAY more than I needed), which cost me just over $60 with shipping. 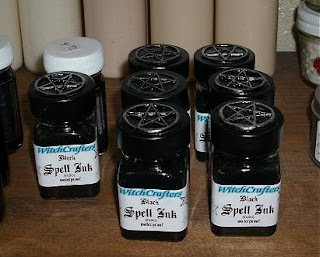 The bottles are the perfect shape and size for ink, but have ugly caps. I am experimenting with painting the lids and adding an appliqué. Between the ink, the bottles, and the three different purchases of nibs, I've got about $130 invested into this little brain fart. I'll have to sell at least 30 pieces to cover my costs. That aught to teach me to impulse buy. Not. Most of my projects seem to take forever to come to completion, partly because I work on up to 20 different things at once, but mostly because I'm lazy and get bored easily. I don't like to work with any sense of urgency. It hampers my creative process. This box has been slowly finding its way for the last few months. It was designed to be similar in style to another box I did a few years ago, but I don't think I want to do that same item again with this. I'm still looking for a new direction to take it. These first two pictures are of the build process. The box was one of those pre-fab craft store things, but a nice one. I look for ones that have character to their shape, or that have physical features that are suitable for a particular purpose. I liked this one because it had a flat top, with slightly rounded edges, and thick walls suitable for carving into. I laid out my design in pencil, then carved it in with a dremel tool. I used a conical stone bit meant for grinding and polishing rather than a steel bur, because it sands the groove as it cuts and leaves a smoother channel. This is soft wood, and it tends to splinter and leave rough edges with a bur. 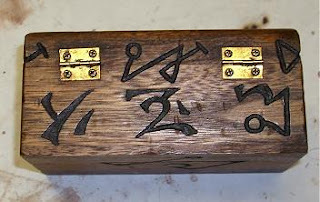 The glyphs I used were chosen for their aesthetic value and have no mystical significance. The bottom row of glyphs on the front and back were taken from some of my favorite fonts, as were the four corners on the top. The center top emblem is my typical eye and tentacles (Eye of Azathoth) with a sun or star-like motif thrown in. The top row of glyphs, that runs all the way around the box, were modeled after Rosicrucian "name" seals, where the name of an entity, usually an angel or demon, is traced out on a rose cross with letters arranged on it. The pattern created by tracing from one letter to the next in the entity's name becomes a symbol for its name. 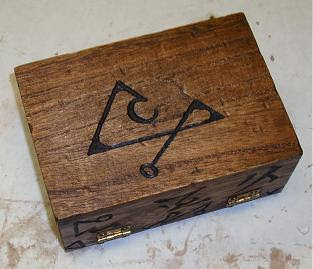 The symbols on the box are only patterned to look like "name" symbols, they have no meaning. 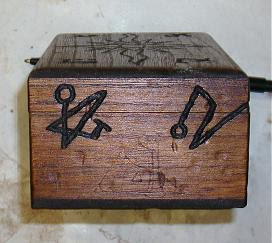 Inside the box is the sigil of Abn-Sur. 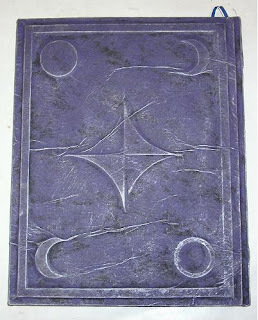 It is a glyph of my own creation that harks back to my Stone Elder Sign disks and the mythos elements I created in my Book of Ioz. 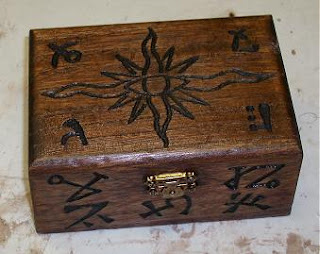 I was going to put an elder sign on the inside of the lid, but I got impatient and decided not to. I probably should have. It is the only surface that doesn't have a carving. Maybe I'll put something else there, some sort of appliqué, if I can think of something cool. 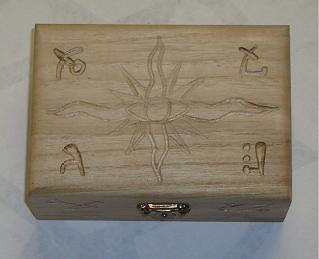 The glyph on the bottom of the box is another one of my own creations. I pulled it from my Necronomicon Pages. 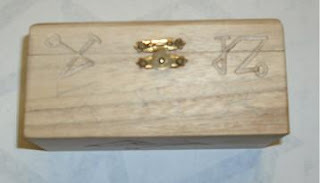 I set these "name" glyphs to straddle the seam between the lid and the body of the box, all the way around, so that they would serve as a sort of "seal" to contain whatever is inside. 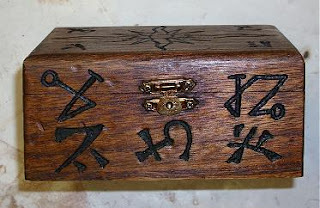 I also purposely made a few of the glyphs wrap around from one side to the next, giving some of them three dimensions and implying that the physical dimensions of the box itself are not a limitation to the powers that seal the box. After carving the symbols with the dremel, I colored them in with a sharpie marker, because that makes them look old and dark, like they have collected the dust and grime of centuries. Then I stained the whole thing with a dark mahogany wood stain. After staining, I banged the sides and edges with a small hammer to make it look older and distressed. Then I finished it off with several coats of tung oil. I didn't want to leave it without a finish top coat, but I thought polyurethane would kill the authenticity. The box itself is pretty much done, but I still haven't figured out what I'm going to put into it yet, thus the project remains incomplete. Let me know if you have any suggestions. A few months ago I made this blank Book of Shadows. It was done using the paper and glue covering method used on previous projects. It started out as one of the blank sketch books I used for the Puffy Paint books. I added chipboard to the covers and spine to bulk them up. The techniques used for this book aren't anything new, but I did get a little more creative with the design elements. I used chipboard to create the border and the moon phases on the front and back. To create the star on the back, I used two different thicknesses of cardboard (chipboard and "shirt box"). It made for a nice 3D effect. The whole thing was covered in glue and brown paper and then painted with black tempura paint, and sponged with purple acrylic paint. It was then dry brushed with silver. 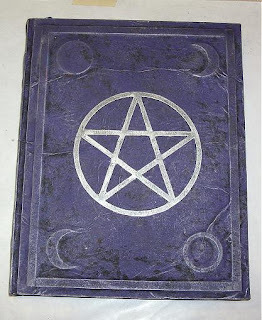 The pentagram on the cover was made from chipboard and spray painted with flat black and dry brushed with silver, with a little silver rub-n-buff thrown in for good measure. Like I said, nothing new here, just thought you might like to see it. I had it for sale in my shop for a few days, but my sales clerk decided she wanted it. She is planning on making it into a companion book for one of her favorite tarot decks. Well, I've been busy spending time with my daughter for the past two months, but now she's back in school, so I can start getting back to my usual distractions. 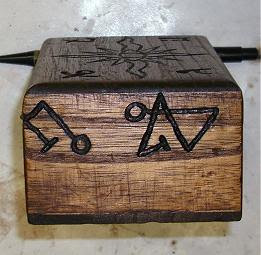 Here is a little portable altar box I made recently. It is one of several I have made over the past few years. 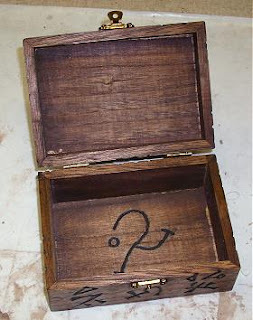 The box itself is one of those pre-build unfinished boxes you can get at the craft store. 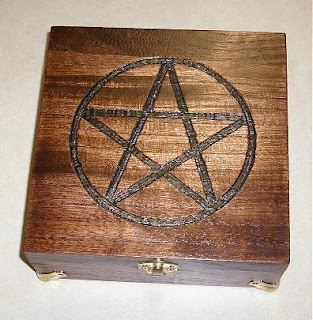 I drew the pentagram on the top of the lid and carved it out a bit with the dremel. 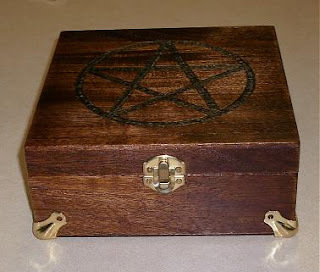 Then I dyed the wood in the pentagram with a sharpie marker before using a mahogany wood stain on the rest of the box. I put three coats of clear poly on it and then added the brass corner pieces at the bottom to act as feet. Although the feet are glued on, I wanted to put brass nail heads over the holes where the screw/nail would go, but I couldn't find any brass brads with big enough heads short of upholstery tacks, which I thought would look terrible,so in the end I left them empty. 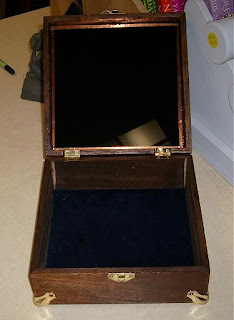 The interior bottom is lined with blue velvet and the interior of the lid features a built in black scrying mirror. The glass was hand cut (my first time using a glass cutter :) and blackened with my patented secret process to make a nice shiny black mirror (well, not actually patented, but it is secret and I'm not going to tell you). The edges of the glass were sanded and then wrapped with copper foil tape (the kind used for making stained glass). The glass makes the lid a little heavy compared to the rest of the box. I had to make two mirrors for this box. The first one was a little smaller and had to be taken out because the type of glue I used caused imperfections in the black backing.